Visitors read an interpretive sign at the ca. 1850 Bushrod Crawford House, now part of the Beverly Heritage Center. One of the earliest settlements in the Alleghenies, Beverly was founded in 1790 as the first county seat of Randolph County, Virginia. With the completion of the Staunton-Parkersburg Turnpike in 1847, it became a major crossroads, providing access across the mountains. As such, it was a crucial prize in the First Campaign of the Civil War. General McClellan’s 1861 victory at nearby Rich Mountain and capture of Beverly led to his appointment as commander of the Army of the Potomac. It gave Federal forces control of northwestern Virginia and led to the formation of the State of West Virginia two years later. Post Civil War development centered in the nearby railroad town of Elkins, enabling Beverly to remain a quiet village that preserves many historical treasures. Beverly (population 649) had its first historic district listed in the National Register of Historic Places in 1978. 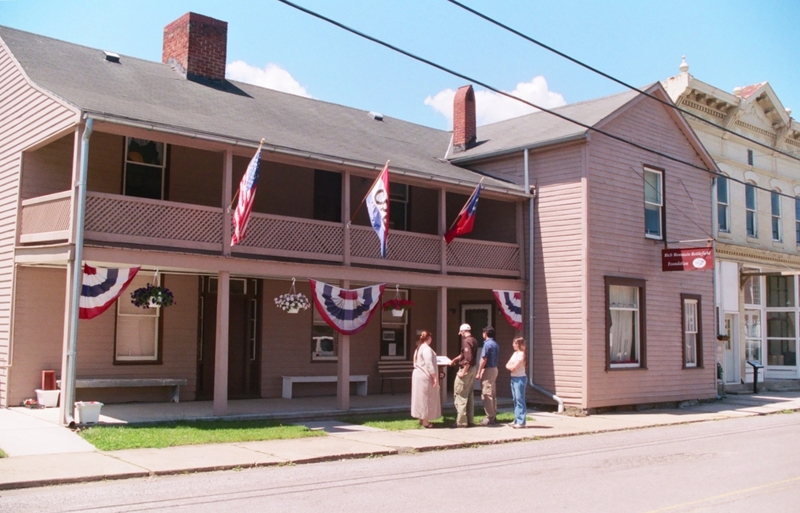 In 1999, and a complete survey of the town’s historic resources was updated. The non-profit Historic Beverly Preservation partners with the Beverly Historic Landmarks Commission and West Virginia Historic Preservation Office to develop interpretive materials including a Web page, a walking tour brochure, and on-site descriptive signs for key buildings. Housed in the 1828 Blackman-Bosworth Store, the Randolph County Museum has a large collection including early settlement tools, Civil War artifacts, belongings of early citizens, and store and business collections. Behind the museum is an original subscription school relocated from rural Randolph County. This small schoolhouse originally housed a school “subscribed” by parents who banded together to hire a teacher before public education was universal. It features an extensive collection of one-room school artifacts and memorabilia. Four adjoining buildings in the heart of Beverly, including the 1808 Randolph County Court House and McClellan’s Headquarters (currently the Rich Mountain/Historic Beverly Visitor Center) are being developed as the Beverly Heritage Center, an interpretive museum and visitor center. Funding to date has included a federal Scenic Byways grant, a State Cultural Facilities Grant, development grants from the State Historic Preservation Office, a National Endowment for the Humanities interpretive grant, and over $200,000 in private donations. The Center will anchor other interpretive and commercial development throughout the historic district, providing a key attraction for the Staunton-Parkersburg Turnpike Byway, as well as contributing to heritage tourism development for Randolph County and the Appalachian Forest Heritage Area. While contributing to economic development in the region, the Heritage Center will also educate the local community about Beverly’s heritage and culture and foster local pride. A biennial Beverly Heritage Day featuring historic home tours, heritage crafts, food, music, and living history raises awareness of local history and historic resources, raising funds for future preservation work. Beverly also participates actively in a West Virginia Civil War Task Force, and the Rich Mountain Battlefield and Historic Beverly are listed on the national Civil War Discovery Trail of the Civil War Preservation Trust. Designated a Preserve America Community in August 2005.